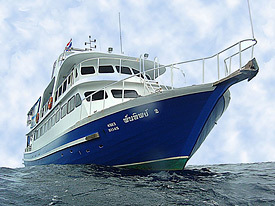 Liveaboard cruises to the Similan and Surin National Parks in Thailand are the highlight of any diving holiday in Phuket. With snow-white beaches and a tropical jungle above the water and spectacular dive sites in often crystal clear water below, it's not surprising that the Similan Islands, Koh Bon, Koh Tashai and Richelieu Rock rank among the top ten diving areas in the world! Exploring these fantastic dive sites from the comfort of one of the selected boats below is truly one of the finest ways to spend your time here. We will help you select the boat best suitable for your itinerary as well as your budget. 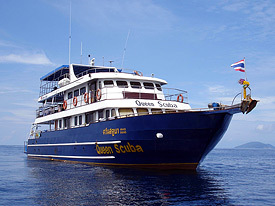 With many years of experience conducting liveaboard cruises in the Andaman Sea, Dive Asia is uniquely qualified to make your Phuket diving experience the best part of your vacation. 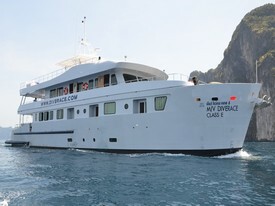 The Brand New M/V Diverace E-Class is the newest and probably most comfortable Liveaboard boat in Phuket. 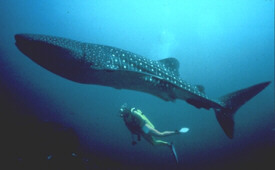 She offers cruises to the Similan and Surin National Parks as well as some Burma cruises. The unique design with private balconies and generous cabin space will make a trip with her an unforgettable experience. Beautifully designed and constructed to plan, this vessel is made for divers in mind. Come on board to try her out. Launched in Dec 2014, MV DiveRACE Class E is built to impress her passengers. As the newest luxury liveaboard to sail Southeast Asia, she is elegantly designed with comfort and safety in mind. MV DiveRACE Class E's design was conceptualized with the help of a team of naval architects and Dutch vessel consultant. She is constructed following international standards closely, with the aim of being a luxury liveaboard of excellent quality, providing the best for each passenger on board during trips. MV Bavaria is a brandnew steel vessel, 28 m long and 6,5 m wide. Planned and designed by Markus Egginger. Based on 15 years of liveabaord experience he knows exactly what divers need and expect. The MV Bavaria was built in Thailand according to the newest ocean-going safety standards. All guests are accommodated in spacious, comfortable cabins with individual air-conditioning. The vessel offers 2 Standard cabins, 8 Comfort cabins with own bath and 2 Deluxe cabins with big double bed. The maximum number of the guests is 24. All cabins are held clean during your stay aboard by our crew. Friendly staff and an excellent kitchen will provideyou a very pleasant stay during the safari. 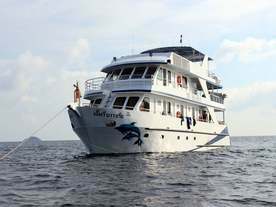 The M/V Andaman Tritan (previouse DiveRACE) is one of the smaller wooden liveaboard boats visiting the Similan Islands. She represents the upper end of the budget Liveaboard category and offers en-suite bathrooms in her Master and Deluxe cabin category for the price of a budget boat. 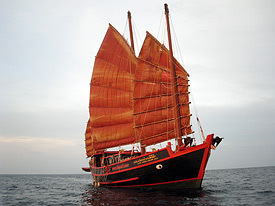 The June Hong Chian Lee (Respect Wind Travel Forever) is one of several junks built in Penang, Malaysia. She is a 30 meter, 140-ton three mast junk with 330 square meters of sails, build in 1962 for charcoal transportation. In 1985 she was restored and redesigned for the first time to serve as a classic yacht. In 1997 she changed owners and was completely restored and set up as a Liveaboard vessel. The June Hong is constructed mainly from a hard teak wood called Takien Tong and offers a unique liveaboard experience that you will remember for a lifetime! This 24 Meter steel boat was completely refitted and remodeled in 2014. 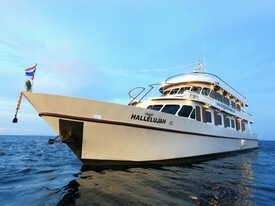 The Number of guests was reduced to 10 persons making her the most exclusive Vessel in Phuket. She has a air-conditioned Master cabin located on the upper deck behind the wheelhouse equipped with a double bed and private Bath as well as 4 deluxe cabins with single beds and en-suit bath rooms. 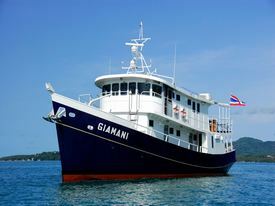 The M/V Giamani offer 4 day Similan Cruises and also the possibility to dive at the southern dive sites of Hin Daeng or Hin Muang either as part of a 6 day dive cruise or a separate 2 day dive cruise. On this boat even a ice maker for cold drinks and a deep freezer for keeping ice cream available on board can be found. M/V Deep Andaman Queen (former Queen Scuba) deserves a special Rating for excellent service on board. Enjoy a hot towel after your night dive, fruit juice on the deck after every dive, and a snack between meals. Absolutely everything has been thought of to make your trip special and to welcome you on board! Deep Andaman Queen is a 28-meter long and just over 7-meters wide, twin-engine steel hull motor boat, with very high safety standards. She was build in 2003 and ciompletly overhouled in 2012. She operates in the Andaman Sea from October to May providing the best diving in Thailand with a comfortable capacity of 21 guests.